Located in the heart of Brooklyn Bridge Park between Piers 4 and 5, ONE°15 Brooklyn Marina, the first marina to be built in New York City in 20 years, is currently under construction with new docks being anchored and a state-of-the-art wave attenuation system now in place. A grand opening is anticipated for spring 2016. 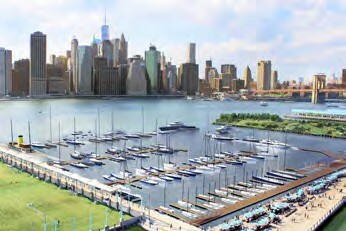 A joint venture between majority owner SUTL Group, a Singapore-based marina operator, and Edgewater Resources, a marine design and engineering firm, ONE°15 Brooklyn Marina offers unparalleled water access to the local community and boating enthusiasts from around the globe. The 106-slip marina will accommodate boats from 16 to 250 feet for seasonal docking, a Sail Club & School, and a members-only Harbor Club. Input from local waterfront experts, residents and non-profit groups all echoed the desire for public access, which became the most important design consideration. The marina will dedicate two percent of revenue toward community programming that will make boating and kayaking available to area residents. ONE°15 Brooklyn Marina’s Community Dock will be one of the largest docks in New York City, comprising nearly 25% of the facility’s dock space. The Community Dock will serve local youth programs in a protected basin, have spaces for kayaks and kayaking instruction, and provide access to New York Harbor for community and non-profit boating programs. With a large fleet of sailboats owned and professionally maintained by the marina, Brooklyn Bridge Sail Club will provide recreational sailing opportunities in New York Harbor, with a selection of seasonal membership options available. Brooklyn Bridge Sailing School will give club members and the public an opportunity to learn to sail or advance their skills, with course offerings including Taste of Sailing, Fundamentals of Sailing, and Learn to Crew. Built with many environmental considerations in mind, the marina will use 40% translucent decking materials to support New York Harbor’s goal of reestablishing a habitat for prey fish. For more information, visit one15brooklynmarina.com.